One of the first Spreads a Tarot Student hears about is The Celtic Cross Spread. This is because it is one of the oldest, most popular, and enduring Tarot Spreads. It is considered to contain an energy that has built steadily from continuous use over the years. When one lays out the Tarot Cards in a Celtic Cross Spread one connects to an energy formed by the hundreds of thousands of readers who have used, and continue to use this Spread for divination purposes. You dip into a power-house of Universal Energy when you work with this Spread. 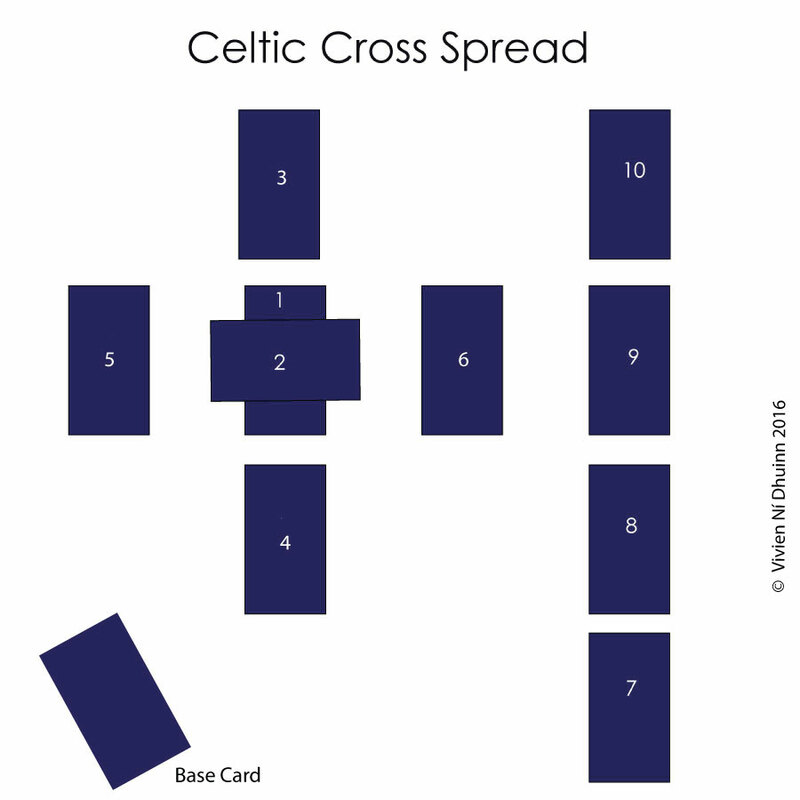 The Celtic Cross Tarot Spread is divided into two sections. On the left we have the Cross/Circle which is made up of six cards (cards 1-6), and on right, The Staff consisting of 4 Cards (cards 7-10). On examination The Cross/Circle, a representation of the Celtic Cross structure found around Ireland, is made up of two crosses; a small internal one which is formed by cards 1 and 2, and a larger external larger cross formed by cards 3, 4, 5 and 6. The external Cross overlays the inner cross. Together the two crosses give an overview of what is happening on both the inner and outer plane at the time of the reading. The Horizontal line of the Cross which runs through Cards 5, 1, 2 and 6, represents time moving from the past, through the present and into the future. The Vertical line of the Cross which runs upwards through Cards 4, 1, 2 and 3 represents the movement of energy/influence from the subconscious or unconscious mind, into the conscious and higher conscious. In the centre there is an intersection where both the Horizontal and Vertical lines meet at Cards 1 and 2. This is where the focus of the Reading is based. Past, Present, Future, Conscious and Subconscious meet from all directions is time, to create this central theme. The Cross/Circle carries Feminine Energy and represents the inner/outer world of the issue. The Staff of Four Cards, is Masculine in Energy and represents the external world, that which is going on in the wider environment relating to the Querant or Issue. It provides information on a broad scale and offers guidance or advice about the situation. It stands apart from the Central Issue and looks in on it objectively. Both the Cross/Circle and Staff bring polarity to the issue by demonstrating the dual nature that is found in all things. We have Feminine Energy of the Cross/Circle surrounding the Querant or Issue, and the Masculine Energy of The Staff forcing movement or progression. Therefore we have a balanced point of view when reading the Spread. The Celtic Cross Spread can be quite tricky for the novice reader who often gets confused with its layout and the order in which to read. The Celtic Cross Spread is multi-layered and a reader needs to be very flexible when interpreting, as much cross referencing and linking of cards is required to get to the heart of the matter. It is not a Spread I would suggest for a complete beginner as it may just put you off reading period. It is a Spread that should be tackled once the student is comfortable with the basic three-card, five-card and seven-card readings. The Horse-shoe Spread is an excellent way to get into training for the Celtic Cross. 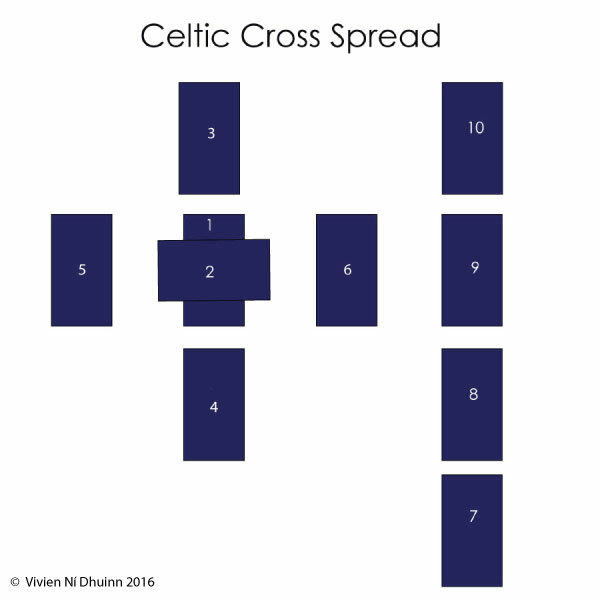 The Celtic Cross Spread can be used for multipurpose readings but is best when there is a specific issue or challenge to be dealt with. Many argue about its suitability for basic Yes/No Readings where a One Card draw would be more beneficial. However it is useful as a follow-up reading after a Yes/No Reading to gain insight into the result. 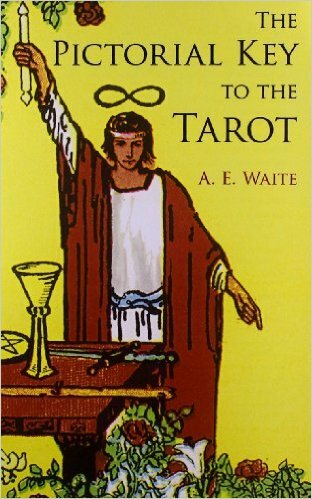 It is not fully known or accepted that Waite used the Tarot Cards for divination himself. It is possible he worked with them for meditation, mystical studies and the Kabbalah. Certain members of the Order are known to have worked with The Celtic Cross Spread but it is mostly associated with Florence Farr. However, the belief is her method of interpretation differed from the version Waite published in the Pictorial Key to The Tarot. 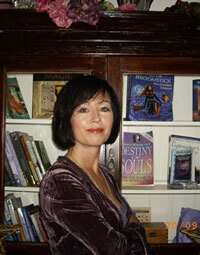 Farr, a British Actress and also a member of The Hermetic Order of The Golden Dawn based her interpretation on Elemental Aspects and Numerology. You might be interested to know that there is some evidence to suggest that Pamela Colman-Smith fashioned the figure in The World Card on Florence Farr who was a friend of hers. The Celtic Cross Spread is thought to be a representation of the ancient Celtic Cross structures found throughout Ireland. 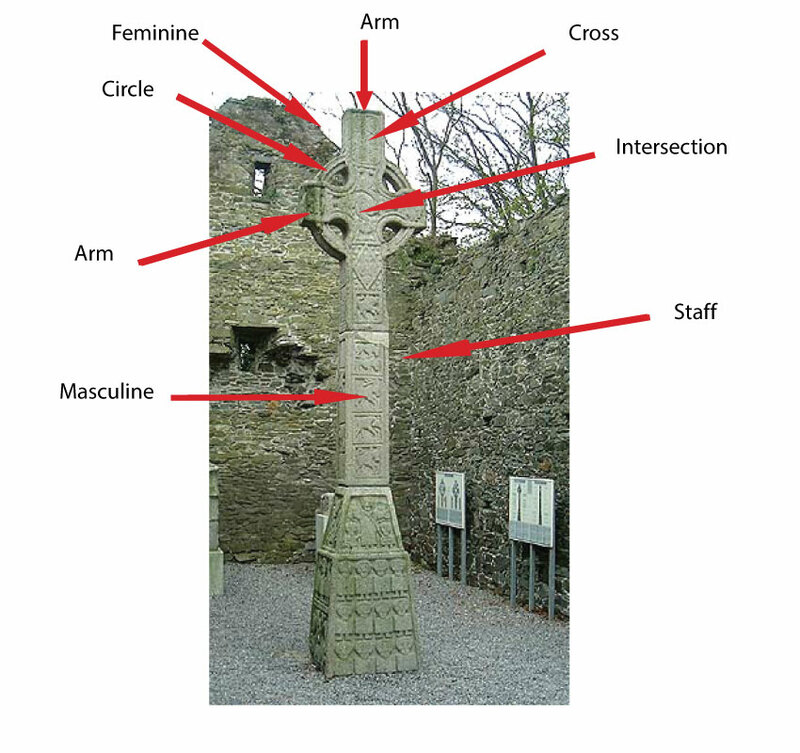 A circle surrounds a cross which links the four perpendicular arms and is mounted upon a pillar or staff. This structure is associated with Celtic Christianity but it has older, pre-Christianity traditions and connections. 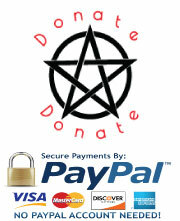 The Circle represents the Pagan Symbol of the Sun. It was claimed that St. Patrick, or St. Declan, had deliberately transformed the Christian Cross by adding the Circle in an attempt to convert Pagans to Christianity. However, historians have now all but ruled that out. Pagans used crosses long before the arrival of Christianity. In the Celtic Cross we find symbolism of the Four Directions and the Four Elements being harnessed and unified by the outer circle which contains their energy. The transition of the Four Seasons; Spring, Summer, Autumn and Winter is symbolised in the Circle/Sunwheel of the Cross. The Celts broke the year into just two seasons. Winter which started at Samhain (end of October) and Summer which started at Bealtaine (beginning of May). Winter was the dark side of the year when the sun was often absent, while Summer was the light side. However, in between they celebrated festivals at Imbolc (our Spring) and Lugnasadh (our Autumn). These Four Points on the calendar are linked to the Four Arms of the Celtic Cross. The movement of the sun was of profound importance to the Celts, and these crosses would symbolically represent the transitory nature of time in all matters; seasons, life, events and issues. There is a natural order in all things. Situations, Events and People come, pass through various stages, and then go. You can see a similar flow of energy in the way the Celtic Cross Tarot Spread is designed. The Celtic Cross is said to act as a Spiritual Navigator. When we look at the Horizontal line of the Cross, think upon it as the Horizon. When we add the Circle to the Cross we now find strong symbolic representation of both the rising and setting Sun, the dark and light side of the year, the Celts’ two seasons. Celts lived their lives by the movement of the sun. They rose with the sun and set with it too. The half orb above the Horizontal Line shows the sun rising above the horizon while the half orb below the horizon shows it setting. When we look at this from a spiritual point of view it can symbolically represents the rising of the consciousness out the subconscious/unconscious realm and then the setting of it once more. This shows a two-way flow of energy. What is created or developed in the subconscious/unconscious, rises up into conscious awareness, and becomes manifest. What has been experienced in the Conscious travels back to the subconscious/unconscious to be remembered, replayed, recalled and stored. Its energy will then rise to the surface once more and influence, or colour, our conscious view of the world and the self. The upper and lower aspects can also be linked to the Higher Self, being the half orb above the horizon, with the Lower Self, the half orb below the horizon. The rising and setting of our consciousness influences and governs our life. What we consciously dwell on, we tend to adopt, until eventually it becomes our reality. One must guard one’s thoughts and dwell only on those things that align with the Higher Self. This is very similar to the layout of the Cross in the Celtic Cross Tarot Spread. When we place the Circle around the Four Arms or Directions of the Cross we create unification and inclusion of these Four Aspects. The centre of the Cross forms a meeting place where the combined energy of the Four Arms, Directions, Elements etc become the focus of our attention. The Staff has always been a phallic symbol and therefore of masculine nature. In the Celtic Cross Tarot Spread, it sits apart from The Feminine Circle/Cross and gives its opinions, views and advice on whatever the focal issue is about. Its energy brings flow and movement to the issue in a manner which facilitates progress and manifestation. When we reflect on all the above we can see how it possibly inspired the Celtic Cross Tarot Spread. Please note there are several theories of this Spread’s origins. The Celtic Cross Spread that Waite refers to has stayed the same since it was first published in 1911. However, the method of interpretation and assigned card positioning have been modified by many readers over the years. Although the Celtic Cross Spread has stayed true to the original design and layout, the cards can be read in different order. When you first start exploring the Celtic Cross Tarot Spread online, in books, or on courses, you will quickly find out that it is taught in several varying approaches. 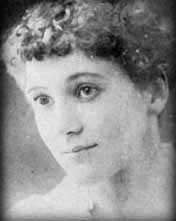 Even Frances Farr, a member of The Hermetic Order of The Golden Dawn assigned her own method. This leads to confusion for the student who is eager to be taught the correct method. So which one is right and which is wrong? If you have been taught a version of the Celtic Cross Tarot Spread that differs from the one in The Pictorial Key to The Tarot, then you can either change to Waite’s method or stay with what you know. At this stage there are so many versions of The Celtic Cross Spread available, it is best to choose the one that feels most comfortable with you, and then stick with. Don’t keep chopping and changing your method as this will dilute the energy that is meant to build up around the repetitive use of reading a Spread in a consistent manner. The same applies to all the Spreads you use. Remember, the subconscious will become conditioned to you laying out a Spread in a certain manner and will work with you on that basis when interpreting. If you flip back and forth with the method you use, your Readings will begin to fall apart. Of course, when starting out on your Tarot Journey, it is best to explore several methods before eventually settling for a specific one. This method of laying out the Cards becomes your signature style and your subconscious will recognise it immediately. **Note Waite changed the positioning of card 5 and 6 depending on which way a Significator was facing. If the Court Card faced to the left, he placed the Past Position Card as no 6 with the Future Position Card as no 5. This would place position 5 on the right hand side of 1/2 and not on the designated left side. This is only relevant if you use Significators and not everyone does. Even if you use a Court Card Significator, it is up to your whether you follow Waite’s method for the Past Position. I was taught the Celtic Cross Tarot Spread back in 1997 and have been using this Spread since. I never questioned the method I was using at the time and to be honest I really had nothing to compare it with as there was very little tarot literature to be found. As the years went by I discovered Waite’s version of the Celtic Cross and methods other Readers were using. I discovered them to be different to mine, and to be honest, I panicked a bit about being wrong. I remember meeting a lovely Tarot Master who had been reading for over 30 years and she told me that there was no right or wrong way with The Celtic Cross Spread as long as you stayed true to its tradition. It didn’t really matter if you changed the order of reading as long as it led to the same approach when interpreting it. 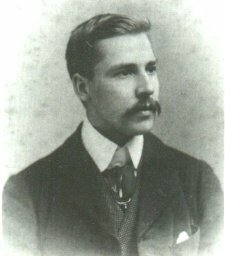 However, with me being so pedantic, I adopted Waite’s version and now use his method. What varies mostly is the running order of Cards 3,4,5 and 6. The Staff that lies vertically to the right with Cards 7, 8, 9 and 10 seems to have stayed more consistent with Tarot Readers over the years. Position 6 – What is Before – ‘This is before him. It shows the influence that is coming into action and will operate in the near future’, or is now passing away’. ( Ref: A .E. Waite, The Pictorial Key to the Tarot, published 1911) – This Card shows what will come into being in the future, which could be weeks or months. It is how the situation or issue will develop or be influenced in the near future. Position 9 – Hopes and Fears – ‘Gives hopes and fears in the matter’. ( Ref: A .E. Waite, The Pictorial Key to the Tarot, published 1911) – This Card shows the Hopes and Fears of the client surrounding the issue or situation. If this is a positive card, it can suggest that deep down, the Querant is optimistic and has a positive attitude. However, if this card is positive but seems out-of-place with the rest of the cards, it may suggest the Querant is entertaining unrealistic hopes or that they are hoping for something which is not in their best interest. One must be careful of what one wishes or hopes for. It might not appear as attractive or desirable in reality. If the card suggests Fears rather than Hopes, the Querant does not hold out much hope for a positive outcome. Their fears may be un-grounded. They may also be fearful of success. Hopes and Fears can be complex and intertwined. It is best to look to the rest of the Spread for more insight and see if they align with any of the other cards. For example, if the card suggests Fear rather than Hope, and the Card in Position 3, The Subconscious Urges, shows a negative influence, then that is where the underlying fear in probably coming from. If it lines up with the Card in Position 2, The Challenge, or Position 5 The Past and it is a stressful card, there may be a connection. If the Challenge/Cross Card is positive and the Hopes and Fears appears more like a Hope than a Fear, remember what Waite mentioned about apparent positive Challenge Cards still being a challenge, or that what one thinks is helping, will not. Then it may align well with Hope Card in the same manner. What one is hoping for may not be ideal or productive. Its a tricky one to work with so you will have to tune in as much as possible. This is where a two-way flow of communication with The Querant is necessary. Reversed Cards in Position 10 suggests blocks and setbacks to manifestation of Desired Outcome. More effort will need to be applied by the Querant, and in some cases, it is time to let go of what one is questing after (the surrounding cards should provide supporting evidence of this). If the Card that presents in this position is undesirable, the Querant can in some instances take steps to change the Outcome. This could be brought about by paying heed to the Action/Advice Card or making some necessary changes. An unwelcome Outcome Card can suggest the Querant will not act on the Advice/Action Card given in Position 7. A Major Arcana Card in Position 10 carries much weight and suggests strength and fixed energy in the Outcome. Should it be Reversed and unwelcome, the Querant will find it very difficult to rectify the situation as its energy will be quite fixed. When a Spread delivers an unwelcome Outcome Card it can be quite disappointing, and at times downright distressing. When it presents you with a vague or ambiguous Card it can leave you feeling very perplexed. Before you throw the Cards aside in despair, or begin shuffling again because you believe you might not have been properly concentrating the first time, it is best to stop and ponder all the Cards before you once more. There may be some clues or connections you overlooked in your initial rush to complete the Reading. It is perfectly acceptable to draw an extra Two Cards in search of deeper insight on The Outcome Card. When drawn, place one Card on each side of the Outcome Card and reflect on any observations you make. Arthur Waite in The Pictorial Key to The Tarot, makes a couple of suggestions. Arthur Waite in The Pictorial Key to The Tarot, makes a couple of suggestions. Waite also gives instructions about what to do in the event of a Court Card being drawn in Position 10, The Outcome. In my opinion, this is very good advice for any Reading. If you wish to work with this method, it is advisable to use Significators in your Readings. A Significator is the Card selected by the Querant or Reader which most closely represents either the Person or Issue the Reading is about. It is chosen prior to Cards being shuffled and some thought must go into which Card is most relevant. If you are selecting a Significator to represent a person, the obvious choice would be one of The Court Cards. A Major Arcana Card may be even a better choice depending on the circumstances involved. You will have to brief the Querant as to the personality traits of the individual Courts, reversed aspect too. With the help of the Reader, the Querant makes his/her choice based on the personality traits that are affecting the issue. This may not necessarily be their generic personality. For example a young man who has just been dumped by his partner, may be in a highly emotional state and not thinking too clearly. He may be terribly upset or even angry. A Reversed Page of Cups or Swords might be more applicable for the Reading instead of the young man’s normal personality card which could be The Knight of Cups or Swords. The Significator should be mirroring the behaviour and attitude of the most active Personality at the time of the Reading. Not all Readers will agree with this and will select on the basis of their Querant’s normal one. Some Readers will select a Significator which most closely represents the Querant’s Sun Sign. Therefore if the Querant is a woman and she is a Leo, regardless of how well her personality matches this sign, they would be likely to use The Queen of Wands. Again it is totally up to you which method is adopted. If the Reading is to be about on an event or situation, selecting a Significator based on the imagery that reflects the story will be more useful. For example, if the Reading is about a row, grief or loss, one might choose the Three of Swords, Five of Swords, or the Five of Cups to best represent the situation. Some Readers will simply shuffle the deck and have the Querant draw a Card and trust that to be their Significator for the Reading. Waite uses a Significator in his version of The Celtic Cross Tarot Spread but again, it is totally up to the individual Reader. He places the Significator directly under Card 1 – What Covers Him/Her. When I use Significators I prefer to see it and not have it hidden from view, but I understand the symbolic aspect of placing the Covering Card 1 directly over the Significator which represents the Querant or The Issue. Significators are useful for ongoing referral throughout the Reading. I usually point to it as I link the Cards. Not everyone has the time to work out the right Significator for the Reading, or to inform the Querant of all the ins and out of the various Court Cards so that they can make their own choice. I use a Significator on occasions but I do not like omitting any card from the deck prior to shuffling as it may be needed in the Reading itself. For me it means there is a potential Card missing from the deck. You also have the option of selecting your Significator, taking note of it and then returning it to the deck for inclusion while shuffling. If it turns up in the Reading, extra attention should be given to it. There are several layout versions for The Celtic Cross Tarot Spread in circulation. Here are two optional placings for the cards which many Readers use. If you are looking for more, then you will find plenty online. Note** The Staff that lies vertically to the right with cards 7, 8, 9 and 10 seems to have stayed more consistent with readers over the years. **Note the meanings of certain positions may vary in some Celtic Cross Versions however, the majority will stick close to the traditional associations. The Method I use is almost Identical to Waite’s except that I have elaborated on the naming of positions. I think Waite’s can be a little ambiguous. I also include a Base Card. Base Card – I use a Base Card in all my Readings. I feel it gives me initial background information that acts as a springboard for the Reading and provides the first hint as to the nature of the situation or issue. The Base Card is the Card that sits at the bottom of the deck after shuffling has finished. I take it aside and place it close to the Spread so that it can be referred back to. I draw the Cards for the Spread directly from the top of the shuffled deck. Position 2 – The Challenge or What Crosses It. As you can see, the core meaning retains its energy. Whichever approach you take, it still presents an overview of the issue on both an internal and external level.